My journey begins today as our group departs Auckland via Singapore to Kolkata, India. Destinations with names like Gangtok and Thimphu that I know will reveal the unexpected, makes this trip one of my more compelling adventures. Getting to this point has not been without challenges as were originally meant to depart two weeks earlier but Indian formalities meant we had to delay. Our itinerary has also been changed and due to political protests, we unfortunately can no longer visit Darjeeling. There is also concern that due to heavy rain the roads may not be in the best condition and we therefore have altered our flights to accommodate a longer road journey. I stepped off the air bridge into the wonderful architectural space that is Netaji Subhas Chandra Bose International Airport. We had entered India on E Visa’s and there is a designated area at immigration to process these however due to understaffing and technical issues our clearance took longer than expected. We were met after customs by our tour leader Mr. Ben Sikder, he represents Travel World Experiences (TWE) the land operator for India and Bhutan who works in conjunction with our New Zealand host company Exotic Holidays. We were accompanied by Ben on the entire trip and used local guides for Kolkata, Sikkim and Bhutan. The calmness and modernism of Kolkata airport disappeared as I stepped outside into a sea of people and a cacophony of horns, an elderly beggar woman approached our group and blessed us in the hope for a few rupees, it was only later that I realized that her clothing was in the likeness of Mother Teresa. Our air-conditioned vehicle was a welcome escape from the intense humidity. The distance of the airport from the city is up to an hour or more depending on traffic. This meant my introduction to this sprawling city of 14 million people was from our bus window. It was late evening as we made our way to our hotel in old Kolkata however the city certainly wasn't sleeping, the patches of darkness were lit up by small road side shops crammed full of wares. Traffic streamed past us as we wove in and out of lanes, colourfully adorned buses squeezed past us with passengers jammed together and hanging out of the doorways, inquisitive faces peered back at us, they smiled as we waved to them. Vehicles parked up on the roadside were used as makeshift beds with people sleeping on the roofs. We approached the city centre and the footpaths were soon overtaken by street vendors cooking a variety of Indian delights, their eager customers crowded around them. The glow of the sulphur coloured street lights exposed the shapes of sleeping bodies, the only illumination in the darkness of their lives. Kolkata or Calcutta as it was once known was originally the capital of India and when under British rule many grand colonial buildings were constructed and these remain today. This part of the city is in Victorian style and our guide called it “little London”. The British East India Company, Writers Building was one of these buildings and today houses the State Government of West Bengal. The Victoria Memorial, a tribute to Queen Victoria is another impressive building. This area is a contrast to much of the city as the grand buildings are surrounded by parks and lakes and is quite a pleasant place offering a respite from the madness elsewhere. The grand buildings were not all colonial however as one of the most beautiful buildings in Kolkota is the remarkable Jain Temple or Parshwanath Temple. The temple is beautifully decorated with mirror inlayed pillars, stained glass windows and the floral-patterned marble floors are stunning. The garden has several blocks of glass mosaics and European statues. During the daytime the city swarms with traffic, vintage yellow taxis streak past honking their horns, people crowd the footpaths. Food vendors line the streets as do shoe shiners, barbers and beggars. We ventured down some of the back alleyways to see enclaves of local industries, here we saw potters, crafts people making statues for an upcoming festival and people coming and going from their homes or work places or playing cards on the street. It is quite common to see huge items being carried on the head. Indoor markets selling everything from fruit and spices to cookware and fabric were fascinating places to visit they are crowded with stalls brimming with goods and bustling with people but the temperature was incredibly stifling, we came out of there dripping in sweat, seeking the sanctuary of our air-conditioned bus. We headed to the coolness of the river banks of the Ganges River. Here we witnessed people bathing in the river, praying and having their heads shaved. The Ganges is a sacred river to Hindus. All along its course, Hindus bathe in its waters, paying homage to their ancestors and to their gods by cupping the water in their hands, lifting it and letting it fall back into the river; they offer flowers and rose petals and float shallow clay dishes filled with oil and lit with wicks (diyas). On the journey back home from the Ganges, they carry small quantities of river water with them for use in rituals. It is also unfortunately one of the most polluted rivers in the world. Foreigners must have a permit stamped in their passport, which is free for the asking when you get your Indian visa. This 15-day permit can be extended at the Tourist Information Office in Gangtok. Your passport is inspected and stamped at Sikkim border check points. A short airplane ride from Kolkata on a beautiful clear day took us to Bagdogra in West Bengal. On our descent, the fertile plains stretched below us scored by braided rivers, the tea plantations and rice fields creating a luscious patchwork of green. This is the closest airport to the north-eastern state of Sikkim and a six-hour road journey still lay before us to get to our destination Pelling. Due to the state of the roads our group was split into two minivans. Our first obstacle on this journey materialized five minutes after leaving the airport, traffic was at a standstill and it was apparent that we weren’t going anywhere fast. It was in fact three hours later that we managed to crawl away from the tangled mess of traffic, the cause being a vehicle accident somewhere. We left the town behind and settled in for our long journey, we passed tea plantations and orange groves, cows wandered along the side of the road. When we crawled through small towns people stared and waved at us, we were a novelty in this untouristed region. Our climb up into the mountainous region of Sikkim was slow progress we left the lowlands of West Bengal at an elevation of 147 metres and would end up at an elevation of 1500 metres and higher. Our vehicle negotiated steep roads with hairpin bends, the sealed roads of the lower elevation soon gave way to narrow washed out roads under repair. We navigated our way around oncoming traffic and road works. We were now in hills forested with jungle and vehicles passed us tooting their horns as did we when our driver felt inclined. It was dark now and we were three hours into our journey when our second vehicle developed mechanical issues and could go no further. The rest of the group piled into our van and a replacement van was sent for. A decision was made that since it would be several more hours before we made it to Pelling that we would reverse our itinerary and go to the closer destination of Gangtok. We left the second van and some luggage behind to catch up with us later. Gangtok here we come! We arrived safely, tired, cramped and hungry but the journey was worth it. The wonderful thing about arriving at a destination at night is the anticipation of what day break will reveal. The revelation of our surroundings exceeded my expectations, we were high in the hills of the city of Gangtok, surrounded by lush vegetation and the view from our breakfast room of the distant Himalayas was stunning. The purest of white snowcapped peaks reached into the cobalt blue sky whilst the hills of Gangtok layered in tones of green framed the picture beautifully. Gangtok has extremes of elevation from 1800 metres down to 1650 metres, this means the city has an unusual mix of vegetation, it gradually changes from alpine to temperate deciduous and subtropical. Forests of poplar, birch, oak and elm at certain elevations mix with conifers and evergreens, rhododendrons, bamboos and orchids. This area truly does encapsulate the Garden of Eden. On this day, we were indoctrinated into the Buddhist culture. On the hill above our hotel we visited our first monastery. The Enchey Monastery was built in 1909 it belongs to the Nyingma order of Vajrayana Buddhism. There was something serene about walking up the hill to the monastery, prayer flags fluttered in the breeze and a wall of prayer wheels on the roadside invited us to offer up prayers. This is a small monastery with 90 monks, the prayer hall is constructed in the form of a Chinese pagoda and has been reconstructed as an earthquake had damaged the original structure. It is a beautiful building with predominantly white and blue accented exterior walls, the ornately carved colourfully painted windows being the standout feature. The interior walls were covered in beautiful and highly coloured murals depicting various stories from the Mahayan Buddhist scriptures. We didn’t encounter many monks at this monastery. However, the lack of monks was soon made up for when we visited the Research Institute of Tibetology and Do Drul Chorten Stupa. 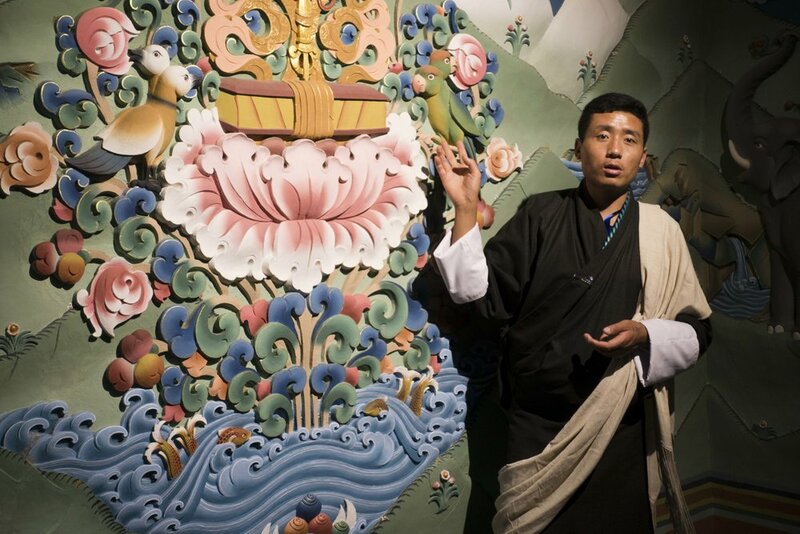 The research institute concentrates on the religion, history, language, art and culture of the Tibetan people. It has a museum and library with rare collections. The museum was fascinating and contained many beautiful and rare artefacts. The tree shaded roadway that led up the hill to the Do Drul Chorten Stupa was suddenly invaded by a stream of monks their crimson robes strongly contrasting with the sub-tropical vegetation. We had arrived at lunch time and the monks were exiting their prayer hall where they had been offering up rice to buddha. The remaining monks were sweeping up the rice in the vast hall and the images captured here are quite colourful. Outside the prayer hall the golden domed stupa stood glinting in the sun, surrounded by 108 prayer wheels. I took the opportunity to walk around the prayer wheels to touch each one, this was a very spiritual experience. Later that day we drove into the hills outside of Gangtok across the other side of the valley to Rumtek Monastery. This is the world’s Dharma Chakra Centre and the seat of His Holiness, the Gyalwa Karmapa, who is the head of the Kagyupa (Black Hat) order of Tibetan Buddhism. The monastery is the largest in Sikkim. It is home to the community of monks and where they perform the rituals and practices of the Karma Kagyu lineage. Opposite that building is a college, Karma Shri Nalanda Institute for Higher Buddhist Studies. The first surprise before entering this monastery was that we encountered armed guards. 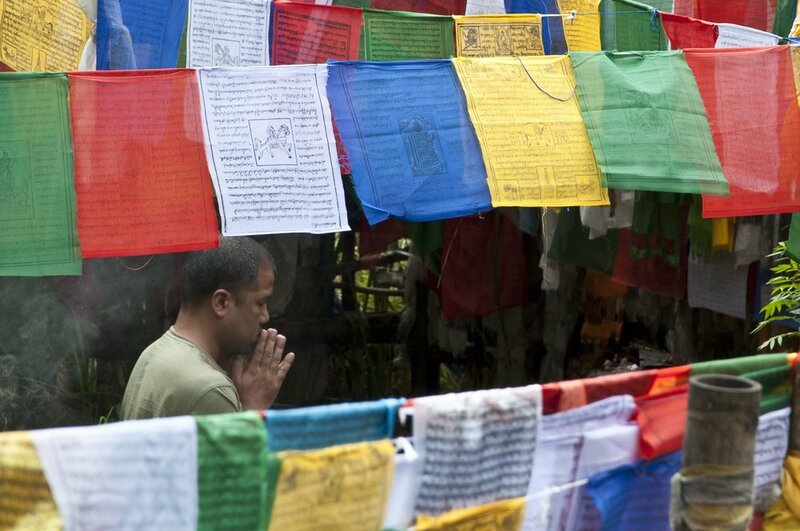 Two rival factions of Tibetan Buddhism are fighting for control of the monastery. The rivalry is such that there have been violent brawls between the monks, accusations of theft and corruption and a travel ban placed on the protagonists by Indian authorities, who want to keep a lid on Tibetan passions. The result is that Indian security forces guard the monastery and the priesthood is split by a bitter legal battle. Indeed, the monastery is in some ways built like a fort with an outer wall protecting the inner courtyard and entry to the prayer hall. The exterior is painted in the beautiful Tibetan patterns and is an outstanding example of this type of artwork. The monastery houses some of the rarest Buddhist religious artwork in the world in the form of wall murals & thankas (scrolls with intricate hand paintings), 1001 miniature golden models of Buddha and the Black Hat (known as the Vajra Mukut) which is studded with gold, diamond, ruby and many other precious stones. It was presented to the 5th Karmapa in 15th century by the then emperor of China. In a separate building to the prayer hall further up the hill is where you will find the Golden Stupa of 16th Karmapa which is made of pure gold. From the terraces of the monastery a magnificent view of Gangtok unfolds showing the extreme spread of the city over the slopes of the hillside. Tea for two or twelve as the case was with our group. Our first encounter with tea was of course on our drive up to Sikkim through the numerous tea plantations but we hadn’t stopped at any of these. It was now time to taste the product. We made away into downtown Gangtok to the Golden Tips Tea Bar. I now have a new appreciation for tea. This was not tea as we know it as I am used to normal strong black tea with milk. I would liken this tea tasting to that of a wine tasting session, several varieties and classifications were on display. I am sipping a delicate Darjeeling Oaks second flush muscatel tea as I write this. I still have an unopened Margaret’s Hope first flush to look forward to, similar teas can be purchased online if anyone would like to try them although the new releases do sell out very quickly. I have listed the classifications below. • The First Flush is the picking of the brand new two leaves and a bud in the earliest spring growth of the plant, as early as February and often lasting through April. These early leaves are usually more delicate and tender and therefore more light, floral, fresh, brisk, and astringent in flavour. To preserve the spring leaf flavour, First Flush Darjeeling teas are generally less oxidised during processing and may appear more greenish in colour than a typical black tea. Darjeeling First Flush tea is some of the most prized and expensive on the market. It is so special and exclusive that tea connoisseurs consider the first harvest from this region to be the “Champagne” of teas. • The Second Flush is picked as early as April and runs through May or June. Second Flush yields larger, more mature leaves with a purplish hue and silver tips or leaf buds. The leaf growth during this period is much more rapid than the early spring growth. These larger, fast-growing leaves yield a stronger yet smoother flavour for the finished tea. Teas from this Flush are known for their full-bodied, muscatel, and fruity flavour. • The Monsoon Flush runs from June or July through October and yields large leaves that brew into a stronger colour and bolder flavour that is less complex or nuanced than the previous Flushes. Teas from this Flush are often used for iced tea and commercial tea bag tea production. • The Autumnal Flush happens in October and November and yields a finished tea with a rich copper-coloured liquor that can be described as rich, full, nutty, and smooth in flavour. Leaf growth slows down during this period and the tea plant is squeezing out the last of what it has to offer before it goes dormant for the winter. The road to Pelling wound its way over the hills like a snake slithering through the jungle. The distance is not that great but the journey is arduous due to the road condition, steep inclines and hairpin bends encountered. To break the journey, we stopped at a tea plantation high in the hills, the views from this vantage point down to the valley below were magnificent, we wandered along the endless rows of tea bushes enjoying the moment, it was only when I got back to the road that I noticed the sign warning of leeches and snakes. Our stop here was prolonged as one of our vans developed a mechanical issue however no one minded as the scenery and tea made time pass quickly. We arrived in Pelling after dark which meant another moment of discovery at sunrise the next morning. We were staying at Chumbi Mountain Retreat at an elevation of 1850 metres this resort is very close to the Himalayas and as the crow flies Mt Kangchenjunga (3rd highest mountain in the world) is only 10 kms away. We were advised to rise early to capture the sunrise over the Himalayas and so at 5.00 am I crawled out of bed and drew my blinds. Stunning scenery greeted me, we were perched high on a hillside looking across a valley. Forested nearby hills and above those the Himalayas looked down on us. Unfortunately, the wispy patches of cloud that lay in the valley around us extended up into the mountains and the cloud cover meant the spectacular sunrise never eventuated. Fortunately, the next morning the weather gods delivered and we were privileged to see the first rays of golden light tinting the snowcapped peaks. I have never felt so at peace in a hotel before perhaps this had something to do with the location of this resort high in the hills and seemingly above the clouds, I can see why this is the favourite hotel of the Dalai Lama when he visits Sikkim. We wove our way through forested valleys the road passed small farming communities, people walking on the roadside waved to us as we sped by. We came across a small picturesque waterfall and had to stop for a group photo. We were on our way to Khecheopalri Lake, the lake is sacred for both Buddhists and Hindus, and is believed to be a wish fulfilling lake. At the entrance to the path leading to the lake a small building housed a large prayer wheel. The path was canopied by an avenue of trees, colourful prayer flags were strung high across the path, the silence of the surroundings was only broken by my footsteps shuffling through the fallen leaves. I came across a woman and her child, the woman toiled away sweeping leaves from the path, the child looked at me and smiled. I came to the small lake in the middle of the forest, the still water glistening in the morning sun, prayer flags dominated the scene and cast a festive atmosphere to this holy place. Prayers were offered up in the hope that wishes would be granted. Incense was burning in a shaded corner of the jetty, here a man knelt and prayed, his profile framed by prayer flags through a haze of incense. An old man walked the path he was crooked and supported himself with a walking stick he was dressed peculiarly wearing a waistcoat, beads and a hat. He stopped and blessed one of my companions with a Hindu Tilaka (coloured dot made of sandalwood paste) on her forehead. This area is renowned for the colonial style hillside resorts, we were invited for a high tea at one of these, The Elgin Mount Pandam. Starched uniformed waiters served us cups of tea and cakes on the terrace from where expansive lawns rolled down into manicured gardens, for a moment I felt like I was in a scene of E.M Forster's novel A Passage to India. A wonderful party and banquet was had the night before and several bleary eyed travellers clambered on board our vans for the journey to Bhutan. The Royal Government of Bhutan sets minimum selling prices for packages to Bhutan. These must be paid in US dollars prior to arrival in Bhutan, depending on the season the rate is USD200 or USD250 per day. perched precariously on steep hillsides they seemed to be secured by the luscious vegetation. Exotic cardamom plants were the dominant crop in this region. We crossed river valleys over several bridges including the historic Coronation Bridge. The scenery changed dramatically as we lost elevation, the roads became straight and in better condition, the lowlands of Nagrakata were dominated by tea plantations and several river systems irrigated the region. Herds of cows wandered the roadside, the intense greenery of the rice fields enhanced by the late afternoon sun. We were heading to the Bhutanese border town of Phuentsholing where we were hosted for the night, first we had to gain entry to Bhutan. It was dark when we arrived at the embassy for our passports to be stamped. Then the unexpected happened, our guide came back with some bad news, the embassy was closed for the night. We had arrived well before the usual closing time but it seemed they had changed their hours. Fortunately, after lengthy negotiations we could enter Bhutan and stay at our hotel as planned. We had to go back in the morning to be processed by immigration. The entry process is quite time consuming when arriving by land at this border as you need to visit the embassy and then at a separate location the border immigration office. To make matters worse the immigration office was having IT issues and they told us to come back later once their systems were up. So, it basically cost us half a day with delays. The evening prior we had met our guide Mr. Wangchuk, he was dressed in a traditional Bhutanese costume known as the Gho, a knee-length robe somewhat resembling a kimono that is tied at the waist by a traditional belt known as Kera, it forms a pouch at the front which traditionally was used for carrying food bowls and a small dagger. I thought that he had dressed up especially for us only to learn later that most Bhutanese wear the traditional costume as a matter of course. Once we had cleared immigration we headed inland over the mountain passes to the interior of Bhutan. The first thing I noticed was how much better the roads were compared to India. The drivers were also much more courteous and the traffic volume was much less. The Kingdom of Bhutan has a population of 797,765 we were heading to the capital city of Thimphu with a population of 104,000 and later to Paro 15,000. The land mass is a similar size to Switzerland which has a population of 8.4 million therefore by comparison Bhutan is a sparsely populated country. The Bhutanese are mainly Buddhist. The six-hour journey to Thimphu was over mist covered forested mountains, the road followed the contours of the hills and wound tightly above the deep gorges. We passed the occasional village consisting of nothing more than a few basic houses brightened up with prayer flags waving in the breeze. Our lunch stop introduced us to our first sampling of Bhutanese food and beer, all very good. Rice forms the main body of most Bhutanese meals. It is accompanied by one or two side dishes consisting of meat or vegetables. Pork, beef and chicken are the meats that are eaten most often. One of my favourite dishes was the Momo which is a Tibetan-style dumpling stuffed with pork, beef or cabbages and cheese. Thimphu lies in a narrow valley spread along either side of the Wang Chu river the town is dominated by the massive Tashichho Dzong, a fortified monastery and government palace. The architecture of Bhutan is considered to be in harmony with the environment and although similar in style to that found in Tibet it is of a more elegant design. Influences from earliest times were from China and Persia. Our late afternoon arrival meant that our tour schedule was once again shuffled to accommodate the complexities of travelling in this region. We were in time for a rushed tour of the Tashichho Dzong before it closed for the day. The sun was setting as we walked hurriedly to the massive structure. The white painted outer wall towered above me, I made my way up the steep steps to the ornate entrance. Security guards and X-ray scanners greeted us. Once we had gained entry we had more stairs to climb leading to a beautiful decorative alcove where images of the guardian kings gazed upon us. An enormous cobbled courtyard lay before us. In the twilight, we crossed the courtyard to the northern prayer hall from where a golden light beckoned. Gold panels framed the doorway to the richly decorated room which houses a large statue of Sakyamuni (the historical Buddha) and the thrones of the current king, past king and Je Khenpo (the Chief Abbot of the Central Monastic Body of Bhutan). We were only in the prayer hall for a few minutes when a gong sounded calling the monks to prayer. This meant we had to leave and we were ushered out just as a stream of monks entered. We stood outside the open door and watched them pray, some of them seemed more interested in us than their prayers which I found amusing. In the hills above Thimphu sits the large golden statue of Buddha Dordenma, this gigantic statue was completed in 2015 and is one of the largest Buddha rupas in the world and contains 100,000 8-inch-tall and 25,000 12-inch-tall gilded bronze Buddhas. We were fortunate on the day we visited to come across a religious festival. Several thousand people had gathered together to pray. Young and old roamed the precinct dressed in their elaborate national costumes. Monks intermingled with the crowd or huddled in groups, an old man swung a large bucket of incense, the blue haze drifting across the courtyard. People walked past with small prayer wheels spinning or clasping prayer beads in their hands. On the edge of this scene I could see monks drying chilies on the tin roof of a building, fascinating scenes unfolded at every angle. The vantage point from the hill gave spectacular views of Thimphu nestled in the valley below, surrounded by emerald green rice fields the town sparkled in the afternoon sun. Who let the dogs out? Bhutan seems to be overrun with dogs, everywhere we went they roamed the streets. They didn’t seem to be threatening but more like pets, I learnt that Bhutanese people, believe that sentient beings should be cared for. And the Bhutanese do care for them though not in their homes. They are treated like community pets. The only issue I had with this was the incessant barking that night meant sleep was difficult, maybe that was why earplugs were provided in the hotel room. The winding road to Paro follows the river along narrow canyons eventually opening out into a wide lush green valley. Paro is a beautiful and peaceful little town 90 minutes from Thimphu. It is easy to walk around with many sacred sites and historical buildings scattered through the area. There is an abundance of shops selling the beautiful Bhutanese handcrafts, antiques and artwork. Paro is the location of the only international airport in Bhutan and hence the gateway for many travellers. 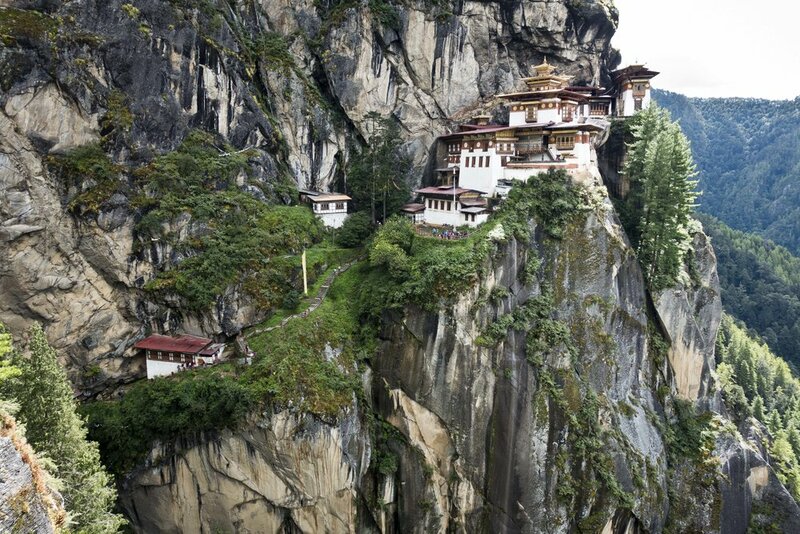 The highlight of my trip to Bhutan was undoubtedly the trek up to the Tiger’s Nest Monastery. It felt like a child waking on Christmas morning, excited and full of anticipation. The atmosphere in our bus on the 10km drive out to the mountain was electric, we were fully charged and ready to go. There was however some trepidation as we were warned that climbing at this altitude would present breathing difficulties. 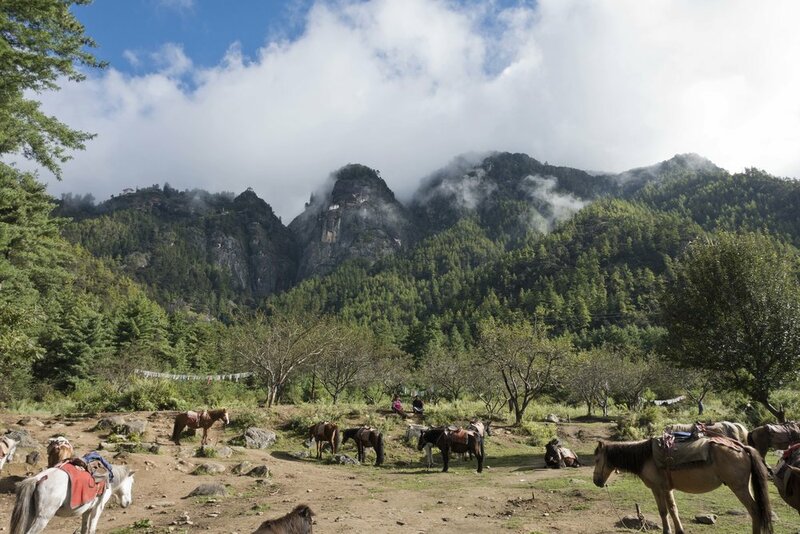 We arrived at the base of the mountain and were kitted out with wooden walking poles, there was also an option for those who didn’t want to walk to travel by horseback to a halfway point. Two of our group opted for the horse ride. The early morning mist that hung in small pockets around the mountain would soon be burnt off by the heat of the sun. After our briefing we began our ascent, the first few minutes were relatively gentle but the incline gradually got steeper and certainly put my lungs into overdrive. I found that I could only walk for a few minutes without resting, it really made me question my fitness however I discovered everyone else had the same issue. I am a regular hiker and was therefore conditioned to the grade of the climb but not the altitude. The track was well marked through the bush and had a few shortcuts which I decided to take. It was only later when I thought about it did I realise that walking on my own wasn’t a good idea in a country where snakes and wild animals existed. It took about ninety minutes to reach the halfway point, the stragglers made it there in two hours. This was a refreshment stop serviced by a cafe that had the perfect vantage point looking up to the monastery. The last half of the walk wasn’t as steep and I found the going much easier with less stopping. The walk flattened out near the top and the main path lead to a bluff with the most spectacular view of the monastery. We were now almost level with the monastery but looking at it across a chasm which we now had to navigate our way down into and then up the other side. This was made possible by hundreds of steps cut into the hillside. This part was almost as demanding as the climb as the required concentration was exhausting, the thought of tumbling over the edge was ever present. Once down at the bottom of the chasm the steps lead to a small bridge crossing a stream, this was fed by a waterfall cascading down the rocks from above. We were now in the shadows of the mountain and about to make the final climb to the monastery. I gazed up in wonder and pondered how it was possible to build this beautiful monastery at this location. The last few steps were tough but what a worthwhile climb. The monastery has several buildings most with small windows looking back down over the Paro Valley. The view is incredible but don’t look directly down as you realise that you are in a building constructed on a precipice, not for the faint hearted. My lasting memory of the Taktsang Monastery is of our group sitting on the floor in the main prayer room meditating. A golden Buddha dominated the small room as monks in their crimson robes busied themselves arranging alms. Our concentration was interrupted when a group of Buddhists from Thailand began quietly chanted a mantra. This was a truly spiritual moment and I left that room with a great sense of calm. The descent back down the mountain once the steps were navigated was relatively quick and I together with another group member was the first down. I was elated to have completed this trek and came away with a great sense of achievement. Did you know that Bhutan has a Ministry of Happiness? The main goal of The Kingdom of Bhutan is the happiness of the citizens, it is even written in the 9th article of the constitution. Because of this, during the national census, every Bhutanese person is asked: “Are you happy? My observation is that yes, they are happy, they always had a smile and seemed contented with their lives. I was sad to say goodbye to Bhutan, my time there was all too short and I hope to go back again one day to explore other regions of this fascinating and beautiful country. Older PostCruising on the Ms Noordam in the backyard.